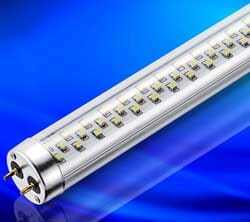 UK - A new LED lighting tube can save any business up to 70 per cent of its lighting electrical bill, says Ventelec. The new LED self-dimming tube has been developed in Hereford for the poultry industry," says Ventelec Lighting Tubes' sales director, Clive Butler. "New legislation on bird welfare requires some birds to have natural light from windows in poultry houses or 20 lux at bird height. "These new tubes dim on their own when the sun comes up. and brighten again when it goes down giving the new 20 lux at bird level. And as each tube reacts individually, the light intensity can remain constant all the times, this removing the need for dawn/dust systems which complies with the RSPCA standard for natural lighting," he added. In addition to the saving of up to 70 per cent on the lighting electricity bill, Ventelec says the tubes are energy-efficient, have a long life, no UV or flicker, do not attract insects and are carbon neutral. Furthermore, the tubes are subject to enhanced capital allowances and Carbon Trust loans. Pay-back can be as little as eight months. For more information, email clivebutler.ventelec@hotmail.co.uk. Ventelec will have the new lighting tubes on show at the British Free Range Egg Producers Association (BFREPA) meeting at the NAC, Stoneleigh, on 2 December. Cut your bills and save the planet: visit Ventelec on stand number 45.